A £70bn plan to overhaul transport across the north of England has been met with a mixed response. Ministers have hailed the 30-year road and railway upgrade scheme as "revolutionary". Transport bosses have also claimed it could help create 850,000 jobs and boost the economy by £100bn. But critics raised questions over funding, with one suggesting commercial space flight would arrive before the promised investment. Transport for the North (TfN) unveiled the plans, which include creating a new rail network, called Northern Powerhouse Rail. 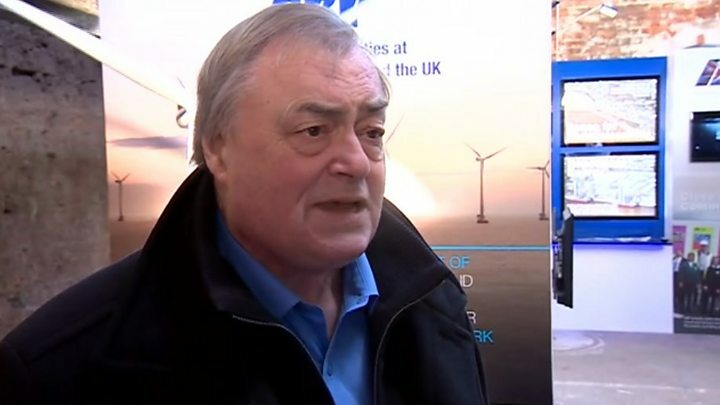 Media captionJohn Prescott explains why he stormed out of Transport for North meeting. TfN was set up to co-ordinate transport in the North, advise government on transport strategy, and enact the plan unveiled earlier. Unlike Transport for London, it does not have the ability to generate its own income. During the event, former Deputy Prime Minister Lord Prescott stormed out, shouting that TfN is "a bloody fraud." He said: "It was promised to have statutory powers. Now we know, and it's been confirmed by government, it will have no powers. "It can talk to the treasury along with the strategic bodies but it can't make a decision and it doesn't get any money. It's a bloody fraud." TfN said that, as a statutory body, it was able to "ensure our plans are formally considered by government when taking decisions about transport investment in the North". Northern Powerhouse Rail, once described as HS3, is focused on cutting journey times, particularly east to west across the North. Improvements to the network would put 39% of business within a 90-minute train journey of four or more major northern cities. 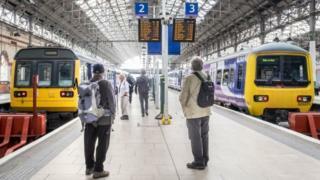 TfN said a new line between Liverpool and Manchester Piccadilly could cut journey times from 50 to 28 minutes, while a new line from Leeds to Manchester, via Bradford, would bring travel time down from 49 to 30 minutes. On the roads, key areas for improvement include links between Sheffield and Manchester, via a trans-Pennine Tunnel beneath the A628 Woodhead Pass, and the A66 between Scotch Corner and Penrith. The report has identified seven "corridors" where investment should be focused. A public consultation on the plan will run until 17 April and a final version is due to be submitted for ministerial consideration later this year. TfN chairman John Cridland said: "Transport for the North's vision is of a thriving north of england, where modern transport connections drive economic growth and support an excellent quality of life. "This is an ambitious programme that will improve our roads and railways, and will also drive a sea change in skills development in the north and ensure we meet that historic gap in investment." Transport Secretary Chris Grayling said the government was committed to transforming transport in the North and had already committed £13bn. On the report, he said: "This is an important step in the North speaking with one voice to set out its vision for transport in the region over the next 30 years." A powerhouse is no more than a cold engine without a vision of how to fuel it. Four years after that phrase, "Northern Powerhouse" entered political lexicon, we have a plan. The theory is straightforward; create enough heat in the form of government spending and the whole area will bask in the warm glow of private sector investment. Delivering on that plan is less easy. The problem is twofold; transport has historically been built from south to north and no one northern city has dominated the region in the way London has the South East. Despite the efforts of successive governments, London has become a black hole, sucking in people and investment while rivalries between northern cities run generations deep. Creating the first sub-national transport body in England in April 2018 is a step towards overcoming this. The question is whether the engine returns on this investment before the runaway train of the South East decouples entirely. The biggest concern from critics in response to the announcement has been over the funding of the project. TfN said it hoped a "substantial element" of funding would come from the government, with other possible sources including revenue from car tax, officially known as vehicle excise duty. Jonathan Bray, director of the Urban Transport Group, said there was still a long way to go in terms of planning and identifying funding. But he said having TfN to "tackle the big challenges" surrounding transport in the North would "hopefully build a consensus around which Whitehall will feel obliged to act". Tees Valley Mayor Ben Houchen said he would be pushing government "to ensure this vision is backed up by proper financial commitments". David Sidebottom, from independent watchdog Transport Focus, said: "Transport can deliver all kinds of economic and social benefits - but it has to work for the people using it." Richard Burnett, chief executive of the Road Haulage Association said: "Any announcement about plans to invest in transport infrastructure is good news, but as always, the devil is in the detail. "Will the proposed funding model go far enough to stimulate the growth needed to bridge this historical gap?" Hull North Labour MP Diana Johnson, who has previously described transport in the North as "woeful", said she did not share in the optimism. She said: "Huge London schemes such as Crossrail 2 are already on the drawing board and are far more likely to get going within the next few years. "I believe that for decades ahead, unless there is a fundamental change in government thinking, we will not see the North getting the much-needed fairer share of transport investment that would be in the interests of the whole UK economy. "Indeed, with legislation currently going through Parliament, it looks like we will see commercial space flight established years before we see real improvements to the North's transport infrastructure."